A decline approaching a quarter of the sow herd. Granted productivity gains have lessened the overall production drain but still not exactly an encouraging picture. There is a variety of reasons for this some known perhaps some unknown, but the result is a weakened infrastructure, much in need of replacement. The bulk of the new “good” barns are from the hay day at the turn of the millennium when the industry grew to its peak. Those barns are now drawing onto twenty years old, with the bulk of everything else south of that. Most could use some serious refurbishing where some should probably just go away. Lack of finishing space at least in Ontario seems chronic as I am asked constantly if I know of any space. I think many producers would agree that there is much space presently in use that might be better retired. However, replacement of capital assets, takes just that capital (and as Jim Long would add courage). Something that has been lacking in this industry of late. For the last while margins have charitably been thin and spotty. Olymel, both Canada’s largest pork processor and pork producer reports in 2018 fiscal year both it’s eastern and western hog production divisions suffered losses bigger than the previous fiscal year. Whereas their eastern fresh pork sector saw positive results second only to 2017 that was their best year ever. The western fresh pork sector had excellent results for the third consecutive year. This would be consistent with most of the other Canadian packers and US packers for that matter in enjoying unheard of margins for three or four years now. Although unless fully integrated a capitalist pork system struggles to figure out how to perhaps better share the margins and this isn’t without consequence. Kevin Grier in his Canadian Pork Market Report suggests the Maple Leaf Foods plant in Brandon Manitoba 4th quarter 2018 kill to be 70-72,000 weekly against an 80,000 plus capacity. 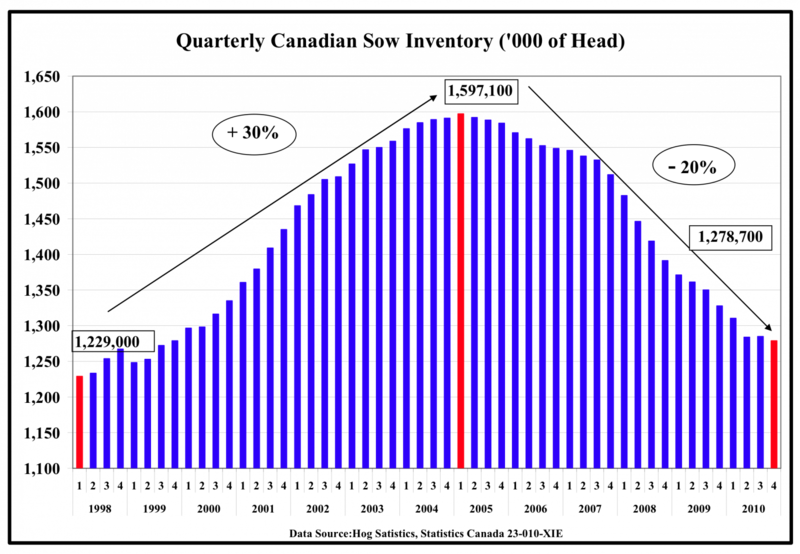 Olymel in Red Deer Alberta running less than 35,000 weekly against 45,000 (single shift) capacity. This doesn’t really work, a pork plant like a finishing barn’s per head costs soar when operating under capacity. So, the question becomes who is going to blink first. 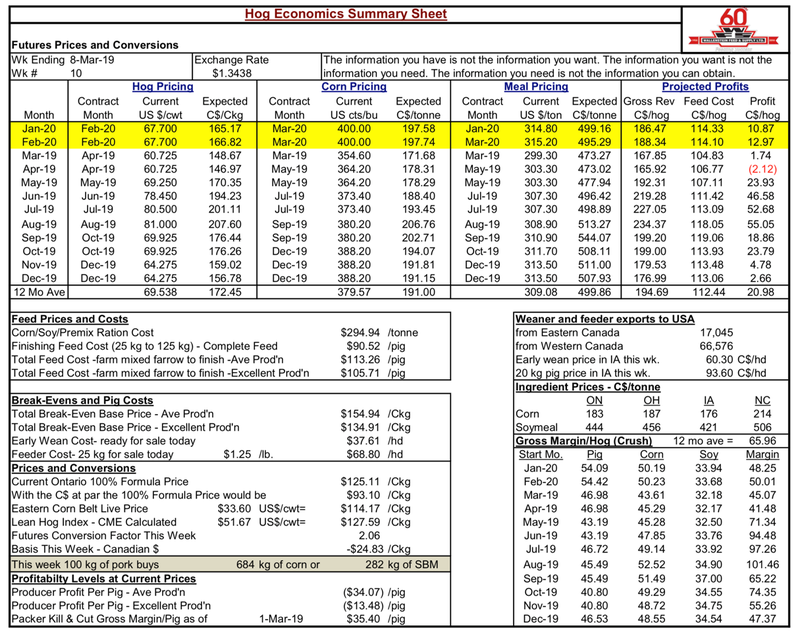 The apparent easy solution to the need for more hogs certainly in producers’ eyes is just pay more. However, to date this seems to have only shuffled the deck chairs from one plant to the other, with no more hogs. Without a solution it would seem a plant is vulnerable to closure. Conestoga Meats (3Ps) in Ontario as the only producer owned packing plant in Canada appears to be a better solution integrating up rather than down. It prices off the meat, leaving the plant always with a positive margin, with the rest going to the producer. This at least for the last three to four years has left the Conestoga shareholder/producers well pleased or certainly more so than other producers in the province. However not sure that there is any convincing evidence that it has given them enough margin for more capital investment than other producers. 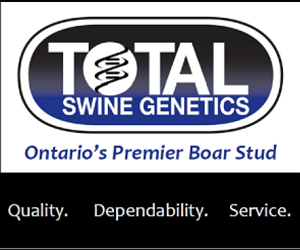 The Ontario sow herd like Canada’s has basically been flat for a number of years. There is no breakdown of inventory contraction or expansion by packer but at least yet doesn’t appear to be any evidence that Conestoga producers have expanded while the rest have contracted but at least keeping the herd stable. Canada has long punched above its weight in the pork export market but in the end to remain competitive usually requires capital and profitability throughout the chain. That has clearly been lacking. Where is that likely to come from? Which brings us to China. My entire career has been filled with stories of how Canada’s (North America’s) agriculture salvation would come from feeding China. China has and continues to have some opposing views on how it is going to feed itself. Food for all countries has a different dynamic than just importing running shoes or electronics wherever they happen to be cheapest. ASF seems like it may significantly change the game perhaps permanently and Canada (North America) become permanent, significant long-term suppliers of pork to China. For most if not all producers here it can’t come soon enough. Without it hard to see how this industry doesn’t continue to see it’s slow decline by a thousand pin pricks. Perhaps the cavalry is showing up just in the nick of time! Let’s hope so.